But all of those phrases have a missing word, right there at the end where it matters the most. Political correctness is one of those things that conservatives love to hate. Understandably; there are few areas where people can indulge in righteous disdain and still maintain broad support (instead of just looking like jerks). And why not? There aren’t many people, I think, who enjoy being on the receiving end of the language police. It’s understandably infuriating to be told that you said whatever you said the wrong way, even though your meaning was obviously clear. Liberals tend to dislike the label “political correctness.” But that doesn’t stop them from patrolling the boundaries of acceptable language and bending over backwards to avoid including offensive words in everyday life. And why not? There are histories of oppression baked into our language, just as they are baked into every other part of our society. Language often contains fossilized prejudice, and we do well to root it out. “Allegedly” is one of those words that people stick in front of disputed things, and it serves the useful purpose of signaling that the dispute exists. But there is another way people use it as well, and that is less about signaling dispute and more about introducing it. And it works! For me, as a reader, when I see the word “alleged” tied to something, it makes me more critical, more doubtful, and more aware that some other people don’t think the thing in question is true. So, I find it rather disturbing when people use the word “alleged” for things like sexual assault, abuse, and online harassment. In this context, the word is used as a rhetorical trick, even (especially?) when the event itself is not really in doubt, to create that doubt. People use this word, in short, to minimize the experiences of women. I’ve been having a problem lately with the word “establishment.” It’s a two-part problem, and one part of that problem is that I cannot seem to read anything about our current election cycle without getting run over by “the establishment.” The other part of the problem is the difference between what it means and how we actually use it. To take the first part of the problem, I keep hearing about how Trump supporters are against the establishment, and how Bernie supporters are against the establishment, and about how no, actually Hillary is also against the establishment, and Cruz is most definitely against the establishment, and to be safe, lets just say all political candidates are anti-establishment. We’ll gloss right over the problem of who the establishment actually is for now and accept that it’s fashionable to be against it. I maintain that doubting and refining (and sometimes rejecting) one’s ideas is a fundamental part of knowing. Without those habits, ideas become brittle and dogmatic, and demagoguery becomes common. Without those habits, we can develop entire concepts with ready-made distortion built in. I think of these concepts as false categories: words or phrases where peripheral qualities are used to define a convenient set of things regardless of relevance. Have you ever had someone ask you a rhetorical question that just made you think “that’s a stupid question,” but you couldn’t put your finger on why? Did you find yourself reluctantly pulled along by their logic, knowing full well that there was a flaw somewhere but unable to find it? This has been my experience when I encounter false categories—I recognize that there is a specious premise in the question, but it take a while to parse it out because it was hidden in the language instead of stated outright. Of course, categories are useful and effective shorthand for thought and debate. This is why we rely on them so much. But human beings are also too enamored of categories; we think too little about them, and we overlook false categories that contain questionable implications. You can draw a circle around any convenient thing and call it a category, and we do, especially when there is an ideological motive for doing so. Case in point, the phrase “black-on-black crime.” For white people, racial tensions they had mostly ignored have become much less ignorable in the recent past. For those white people motivated to dismiss the idea that racism still has any role in American society, “black-on-black crime” is a refuge. “Look!” these people can say, “there are proportionally more murders by black Americans of black Americans! Black-on-black crime is the real issue you should focus on, not [insert topic here].” Black Lives Matter? Then why don’t they focus on Black-on-Black Crime (and stop picking on George Zimmerman, or white people, or police officers)? On the face of it (ignoring the false choice idea that you can only focus on one thing at a time) the category of “black-on-black crime” is apparently real. FBI crime statistics bear out that there is, indeed, more crime within races than across races, and more crime overall in black communities. So one could be forgiven, after a cursory glance at the data, for thinking the category of “black-on-black crime” is a natural category with real implications. Which is where a lot of people would stop, so let’s not. The phrase “black-on-black crime,” especially when used in discussions about structural racism, implies a false equivalency between crimes motivated by racism and crimes motivated by poverty. To suggest that the Black Lives Matter movement should focus on “black-on-black crime” instead of structural racism in police departments implies that because more poor black people kill other black people than do racially motivated police, the latter should be somehow less important. Even the premise that you could focus on one and not the other implies no chain of causality between a community unable to trust its police force and the levels of crime within that community. The phrase “black-on-black crime” carries with it the implicit limit of violent crime, the sort of crime where one or two people have one or two victims and there is direct interaction between them. If one includes fraud, embezzling, tanking the world economy, or various other kinds of white-collar (and mostly white-person) crime, the question of who counts as a victim becomes altogether muddled. White people often talk about white-collar crimes as “victimless,” but I think all the people who got stuck in foreclosure after being bamboozled into bad mortgages would disagree on that point. The thing that bothers me most about “black-on-black crime” is that it is fundamentally a bait-and-switch. The category acknowledges that race is an important factor in the discussion, but then uses that importance to divert attention and avoid responsibility. It betrays a deeply separatist view of American society and carries the deep conviction that races are just different, which leads treacherously to the idea that some races are more criminal. Crime in white communities is painted as an aberration, but the implication of the phrase “black-on-black crime” is that crime in black communities is inherently tied to the racial makeup of those communities. Never mind that we know crime is actually tied to the density and socioeconomic makeup of communities, and societal structures and history have conspired to make poor urban communities more black than white. This is why I believe “black-on-black crime” is a false category. Like many false categories, it takes an incidental factor and paints it as causal. Usually that’s just a mistake, a cognitive shortcut that we take so often that it’s tough to avoid. In this particular case, though, it echoes a long and shameful history of white people judging other races as inferior. Some white people try to convince themselves that they no longer do this. Some try to convince themselves that racism isn’t a real part of society. “Black-on-black crime” does have something real to say about race, but what is has to say is that uncomfortable white people are trying very hard to look away. Racism, though, will not be buried in so shallow a grave; it will keep rising to the surface until we deal with it honestly, and structurally, and humbly. I love words. I also love science. And, because I love both, I pay attention to the interesting places where the words of science and the words of society do not quite match. Scientific terms need to reflect a series of characteristics shared by the things they describe, and we need to know what those characteristics are. Scientists need to be able to look at new astronomical bodies and categorize them, so the “I know it when I see it” approach that works for most of the rest of us most of the time just isn’t good enough in science. From that perspective, it makes sense to update the definitions of things to reflect our growing knowledge. The word “planet” is one such example. Yes, it was infamously revised (scientifically) to exclude Pluto as a planet. There were lots of good reasons for this, not the least of which being that scientific language, unlike regular language, needs to limit its fuzzy edges. And people, including me, were sad to see Pluto dropped from the A-list in our solar system. Scientifically, it makes sense for now—but even in science, language changes. Last week I was traveling and exploring places few people ever go. At the same time, the New Horizons spacecraft made its closest approach to Pluto, visiting it more closely than we ever have before. Over the coming weeks and months we will learn more about that tantalizing little world than we have ever known. Maybe Pluto will shift categories yet again. Pluto is a good example of the fuzziness of words, because the scientific redefinition of the word “planet” exposed the fuzzy definition we had been using for a long time. It’s not that “planet” is unique, either. In the rest of society, words are not defined by hard and fast categories, because language is fundamentally democratic. What about dictionaries, you ask? Dictionaries describe words; they don’t prescribe meaning. If most people use a word a particular way, that is a meaning of that word. If other people use it differently, the word has a second meaning. And so on. And there are lots of places where the dictionary or scientific definition of a word does not encompass everything it can mean. For example, have you ever witnessed an argument about whether tomatoes are fruits or vegetables? It depends on your definition. Colloquially, they are vegetables. Get a little more specific and they are fruit. Get even more specific and they are vegetables again—along with all fruits, and grains besides. But the whole argument misunderstands the point; tomatoes are not inherently one word or another, they just are; we decide what to call them, and when, and why. Let’s try again—how about the word “theory?” In scientific terms, a theory is a general explanation of some phenomena that is deeply and broadly supported by the evidence. In colloquial terms, a theory may be nothing more than an educated guess. This is why many people arguing about the “theory of evolution” consistently and fundamentally misunderstand the subject. The edges of the word “theory” are fuzzy. And let’s look at one more example, something you might not think has fuzzy edges (except in reality): a dog. Picture a dog in your mind. Dogs have paws, long noses, ears, four legs, tails. What about a dog with only three legs? Is it still a dog? What about dogs without tails? Still dogs? What about a cross between a dog and a wolf? It meets all the qualifications to be a dog, except something weird happens there because it meets the qualifications for a wolf as well. So which is it? Or is it both? The edges are fuzzy. A moment ago you might have tried to think up a definition of “dog” that excludes my edge cases, maybe something about DNA. If so, you’re not alone; the reaction of most people, when faced with a fuzzy edge, is to clarify it—to draw an arbitrary line and defend that line heartily. Tomatoes are fruit, end of story. But must we? Language doesn’t actually work this way—everything has a fuzzy edge of you look close enough, and that’s a good thing. It is a deep reminder that words are imperfect stand-ins for reality. Scientific language can and must be precise, but the rest of the time we can have fun. We can have words that mean different things to different people. This is how language works. This is how language lives and grows. So let me return to Pluto for a moment. Now we are closer to Pluto than we have ever been. New Horizons has taken hundreds of photos and collected amazing data about an alien world. It is a world that has sparked our imaginations, inspired us, captivated us, and all from a long cold orbit on the edge of our solar system. It is a tiny world on the fuzzy edge between our definitions, and between us and the rest of the universe. Is Pluto a planet? It doesn’t matter. 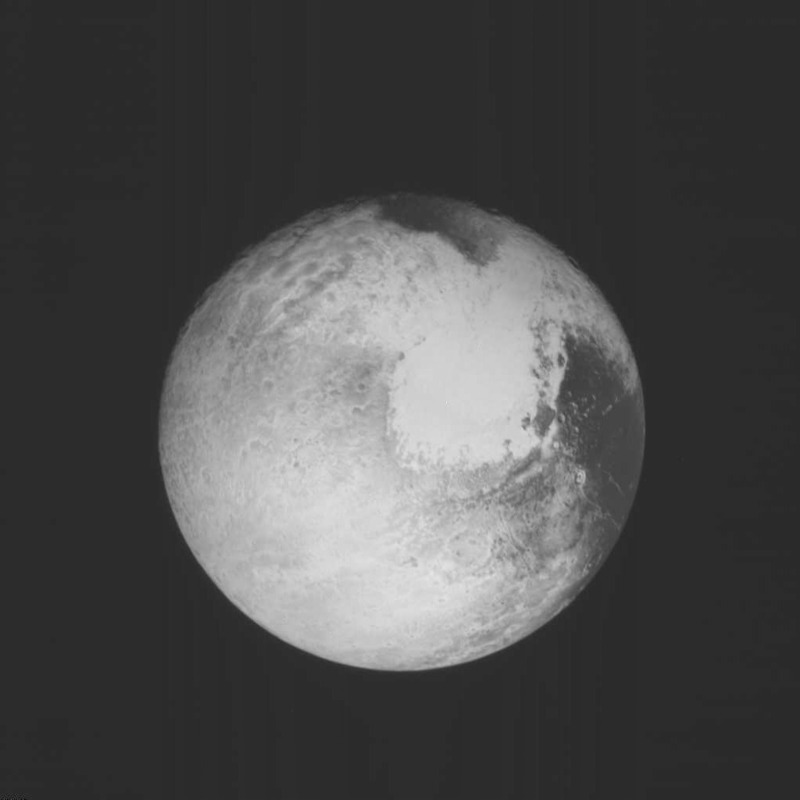 The edges may be fuzzy, but today, Pluto is looking beautifully clear.